On August 25 and 26, the Jamsil Olympic Stadium was buzzing with excitement for BTS’ LOVE YOURSELF Seoul concert. Following the two-day concert in Seoul, BTS is set to continue their world tour across 16 major cities in North America, Europe and Japan. We can just imagine how ARMY around the world are looking forward to the upcoming concerts. At the Seoul concert, UNICEF KOREA ran a very special LOVE MYSELF for ENDviolence booth. Set up in the auxiliary stadium, the booth provided an opportunity for ARMY to not only learn about and join in supporting the #ENDviolence campaign but also participate freely in the various activities prepared. ARMY were thrilled to visit the booth. From the fans waiting orderly in line to those who were willing to stick through the rain, the sight of ARMY taking the time to really think about the campaign message and donate to its cause was touching and beautiful. Among the various activities prepared at the booth, there was a photo zone where fans could take pictures holding the sign BTS used at the agreement ceremony. On this very spot, many ARMY made special memories by posing with the #BTSLoveMyself campaign sign. The booth also ran a henna event, where fans could get the LOVE MYSELF campaign slogan #BTSLoveMyself or #ENDviolence sticker-tatted where they wanted. It was the most popular activity at the booth. Many thanks to all ARMY who helped spread the campaign message by uploading their henna pictures on social media and using the campaign hashtag! It was truly a pleasure to be able to meet so many ARMY and share the campaign message with them in the two short but very meaningful days of the Seoul concert. 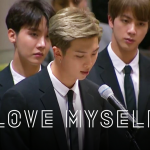 Please remember to LOVE MYSELF for the upcoming world concert! On August 25 and 26, the Jamsil Olympic Stadium was b..